I love traditional health and beauty remedies. Sometimes, indigenous wisdom is more effective in its simplicity and potent connection with nature and the human body in ways that modern medicine seems to have forgotten. However, our grandparents did not get everything 100% right – as these advertisements prove. Though they do explain why everyone from that era has such “happy memories” of their youth! 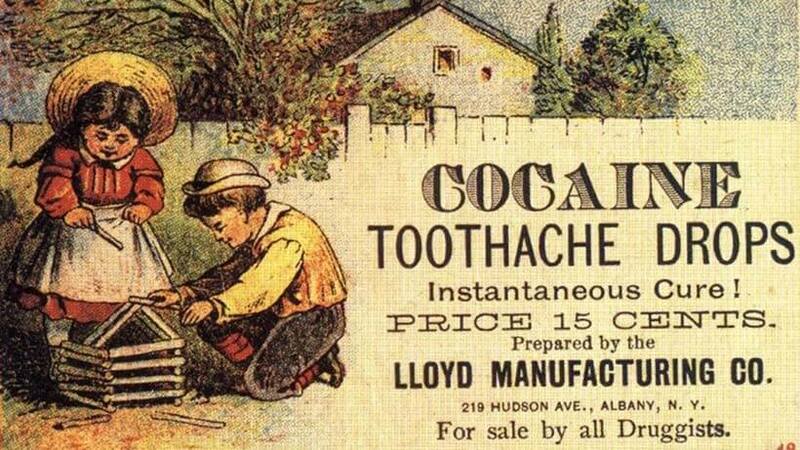 Very popular for children in the 1880s. Not only did they relieve the pain, they made the children very happy! At 40% alcohol plus 3 grams of opium per tablet, it didn’t cure you. But then you possibly did not care! 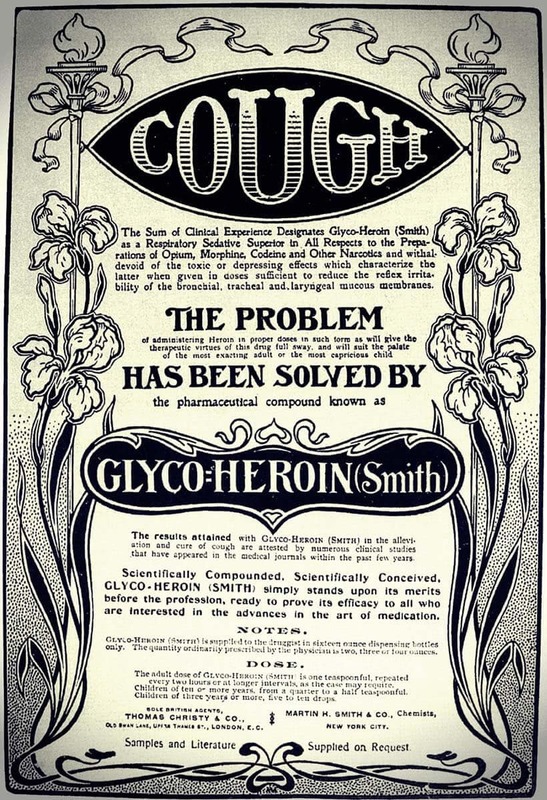 Between 1890 and 1910 heroin was sold over the counter as a “non-addictive” pain killer. 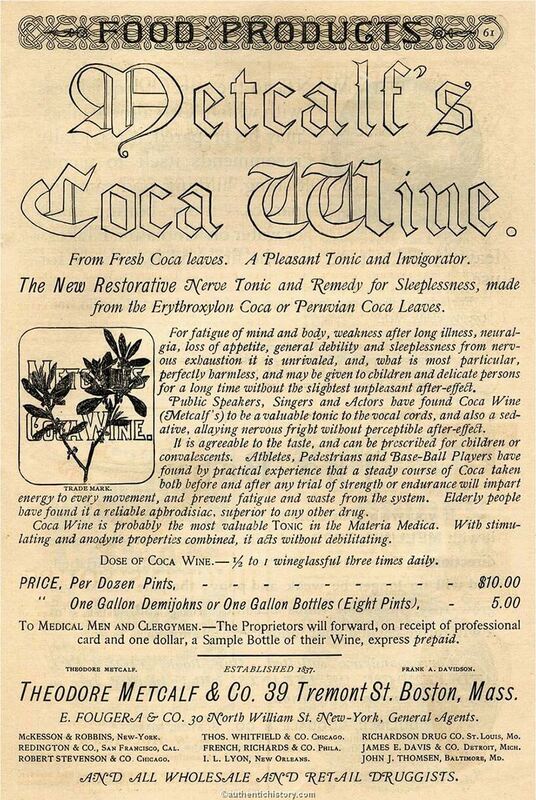 It was also used to treat children suffering with a strong cough. I’m surprised that they remember anything! This was just one of a huge variety of wines with cocaine on the market. Everybody used to say that it would make you happy and it would also work as a medicinal treatment to rejuvenate the entire body systems. It was suggested that you should take a full glass with or after every meal; children should only take “half a glass”. So popular were these concoctions that by 1875, Pope Leo XIII used to carry one bottle with him all the time. And as further proof of its health and wellness quotient, he awarded Angelo Mariani (a leading producer of coca wine) with a Vatican gold medal. In the early 1900s all stage actors, singers, teachers and preachers had to have them for a maximum performance. Great to ‘smooth’ the voice. I’m sure this would make them sleep well (not only the opium, but also 46% alcohol)! It’s no wonder they were called ‘The good old days’! However, just remember that there is a reason these “traditional remedies” have been banned for the past 100 years or so – so NO experimenting!